Fixing a time to visit Sr Helen takes some doing. She has a busy diary, one which includes two sessions weekly to hone English language skills for a Jesuit from South Korea, and a young Vietnamese lass who wants to write her life story. And the first Friday of every month, she goes to the Carnsworth Aged Care facility in Kew to share a Prayer and Song session with the residents and to be with the afterwards for a cuppa and a chat.. Her Jesuit student is learning to use a more idiomatic form of English, “I am helping him to shake out his English into everyday language,” she said, sitting in the cosy library at Mononia in Fitzroy. Her Vietnamese student is heavily into grammer which she likes. “She s a joy to teach,” Sr Helen said. The students are the latest beneficiaries of Sr Helen’s teaching skills, developed during decades with the Sisters of Charity. This year (2017), she celebrates her platinum jubilee, along with Sisters Marguerite Moloney and Eileen Thynne. Her teaching career is one which Helen, who celebrates her 94th birthday in November, never dreamed of following in her early years for years despite – or perhaps because of the fact that both her parents and her aunts had been teachers. either because of or despite the fact her father was a teacher. Equally dismissed was the thought of becoming a religious Sister. “That was the last thing on my mind!” said Sr Helen. Her mother had died in 1933 at the age of 37, when Sr Helen was just under 10. She was the eldest of four – Michael, three years her junior, Jan, four years younger, and baby Adrian who died at three months of whooping cough. An aunt of her Dad’s helped out for two or three years with the young family. After this, a widow, Mrs Robson, was employed to look after the children and the household. She endeared herself to the household straight away as Auntie Mazie, a much loved by all until her death some 40 years later. 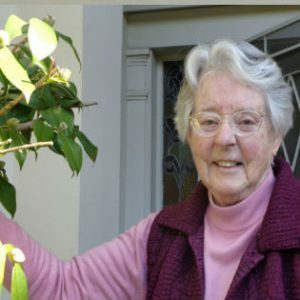 Sr Helen learned shorthand and typing at night at night school, and worked first with the Melbourne Chamber of Commerce and then with the State Electricity Department. She still had no intention of becoming a teacher. But about this time, Helen became suddenly and vividly aware of a religious vocation. “I had the distinct conviction that I ought to be a nun, but I didn’t tell anyone. Not a soul. I didn’t mention if for more than two years. I prayed night and day that I wouldn’t have to become a nun. But my prayers were not answered. All the time, that feeling never left me. In the end, I thought I would have to do something about it.” But what? Helen decided to go to see the Carmelite Convent in Kew. But “it took the nun in the other side of the grill about five minutes to sum me up and to tell me that I didn’t have a vocation to Carmel.” Sr Helen went home relieved but the relief did not last long. The sense of call persisted. So it was that Helen chose the Sisters of Charity who had taught her at CLC. Only then, not long before her 21st birthday, she told her Dad and her family. They were amazed. That was November, 1946. By February 2, 1947 she was in the novitiate in Potts Point, Sydney. But still it was not plain sailing. Sr Helen was hoping she would be sent home! However, at a certain point in her postulancy, all her defences broke down and gave way to a deep sense of peace. That peace has remained with her since. And then there was the teaching. “I knew I was cut out to be a teacher.” And university also followed. The three things she had resisted mightily in her late adolescence came together in her faith life. 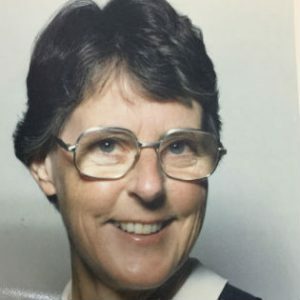 She taught in many RSC schools, including CLC East Melbourne, CLC Eltham, and St Colomba’s Essendon. Midway trough her time at St Columba’s, she was given by the Congregation a wonderful 12 months of renewal overseas. And when she eventually retired from the classsroom there were 20 years plus un adult migrant education which is where she still finds herself today though on a much smaller scale.